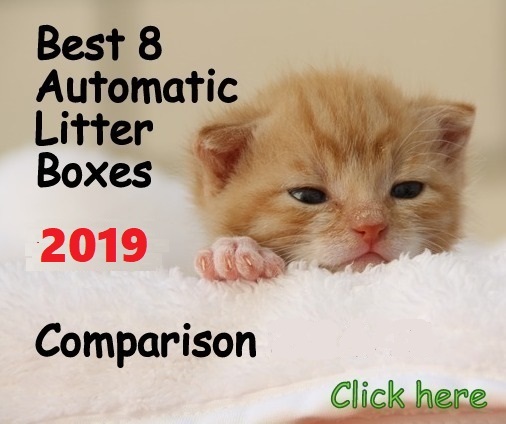 This article is the result of an experiment I did using the most popular cat litters to discover which is the best to use with the Litter Robot III cat box. This comparison took me a year to conclude, but I am happy with the results because I can honestly give you the best choices without you needing to try them all. 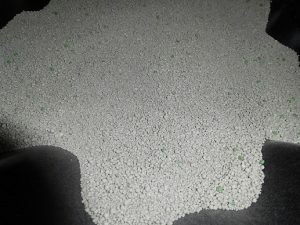 I took pictures and recorded videos each time I opened a new cat litter. I also created a demo imitating the cat urine by pouring some water in the litter to see the clumping capacity and sealing. I also recorded the Litter Robot Open Air rotating and how the clump slides with each particular cat litter. 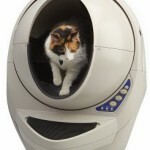 The Litter Robot has excellent odor control with any good cat litter due to its sealed waste drawer. 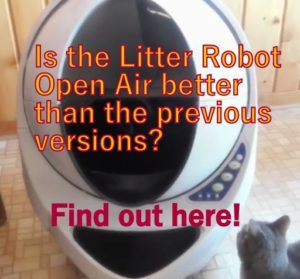 The odor control I mention in this comparison is the odor I perceived when I had to empty the waste drawer of the Litter Robot after 7 days. I must mention that all of the reviewed cat litters are excellent to use with the Robot machine. 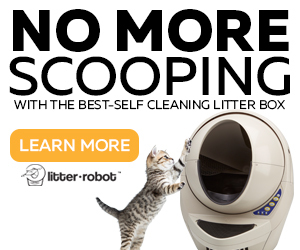 I rated the following clumping litters according to their best features for the Litter Robot. I didn’t consider price on my analysis. I just wanted to find the best cat litter to use with the Litter Robot. 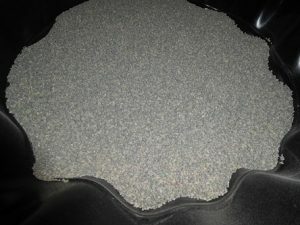 I made the videos in the order I use the cat litter so the top #1 was not the first cat litter I used. I mention this because in my videos I mention the order of reviews that doesn’t match the order of the ratings. I had a very good experience with this cat litter. 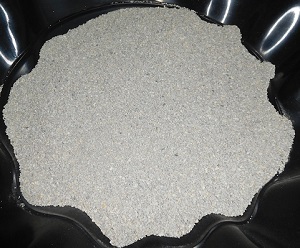 Much less litter scattering which means less to clean on the litter mat and the odor level after one week was very low. The litter weight is not heavy and not light either, it has a good balance. When I poured out the litter I saw very little dust, almost non existent. When I poured water into the litter the clump formed pretty fast and when the Litter Robot started to rotate, the clump moved smoothly down into the waste compartment. All in all, this is a good litter to use with the Litter Robot 3. The Simply Unscented is a great option if you can’t stand fragrances. 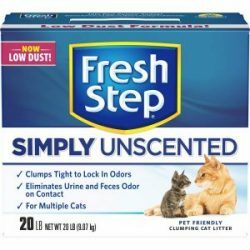 Check the price for the Fresh Step Simply Unscented here. I really liked this cat litter a lot. 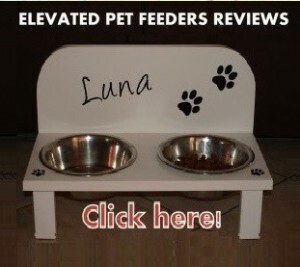 It has a balanced litter weight which creates very low litter scattering when the cat jumps out. This means very little mess around my Litter Robot. 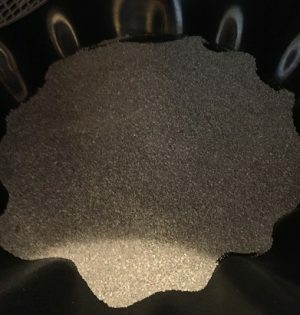 When I put water in the litter it created a clump rapidly and very well sealed too. I made a video of my cat using my litter plastic container to do her business (lol) and there you can see how well formed the clump is. This is really important when the Litter Robot is rotating because it doesn’t break down the clumps which keeps the inside of the machine clean. I poured half of the bag into my plastic container and I saw zero dust. None. Also, as I cut one corner of the bag I decided to directly pour litter into the Litter Robot and it was really easy. If you cut only the corner of the bag you won’t have a problem pouring litter directly through the opening of the Litter Robot. The bag comes inside a heavy duty cardboard box that protects the bag from any damage. The odor control of Litter Box was acceptable to me. 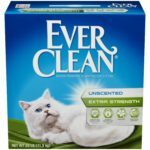 This litter is natural, without fragrances or chemicals added, which is a good alternative if you or your cat has allergies or intolerance to scents. Check the price of the Litter Box cat litter here. I have been using Arm & Hammer Double Duty with my Litter Robot for a while with good results. When you use the same cat litter you don’t get to compare the features of it regarding other litters. 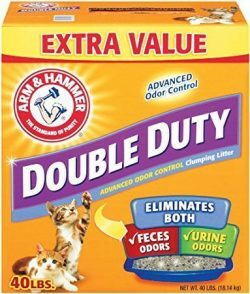 I noticed that Arm & Hammer Double Duty produces more litter scattering than other litters I tried so I needed to clean more often. 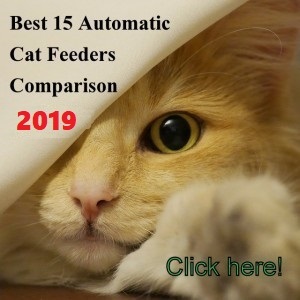 The litter weight is on the heavy side, which is good because it requires less to reach the calibration for the sensor to activate which means you save more on cat litter. The main “con” is the scent of this cat litter. If you don’t want to smell the litter right from the box, this is not your option. If you don’t mind scents this is a good economic choice. Check the price of Arm & Hammer Double Duty here. 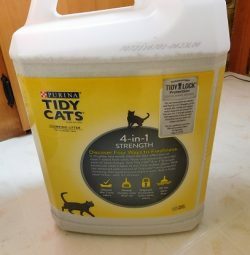 I must say I loved this cat litter because of its container so easy to pour. I just loved that fact. I usually pour down all the litter from the box into a plastic container and this time I didn’t need to do that. This container makes it so much easier for someone with back aches or arthritis. The litter weight is lighter than other brands which leads to more litter scattering (not good). I also noticed less odor control than other brands. The clump formed fast during my experiment, but I noticed the clumps breaking down during rotation. 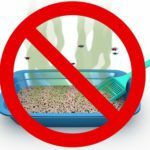 Ideally, the cat litter needs to create firm clumps to slide down onto the waste drawer without breaking down during the process. 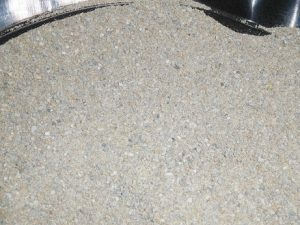 All in all, it’s an easy-to-use cat litter that doesn’t create much dust, which is good, but the scent could bother you. The main “con” is the clump breaking down when sliding which puts this litter in position #4. 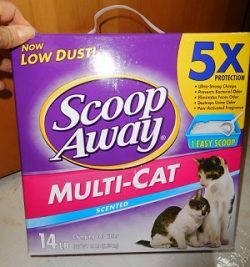 This cat litter has low dust, when I was pouring this litter in my plastic container I saw very minimum dust, which is excellent. The litter scattering is not that high so it won’t be a mess around the litter box area. One of the best features of Dr Elsey’s litter is its clumping capacity. The clump forms really fast and it gets hard. 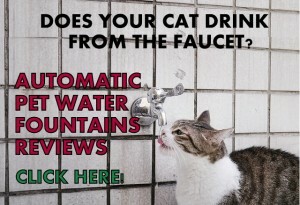 This is good if your feline friend creates soft feces. 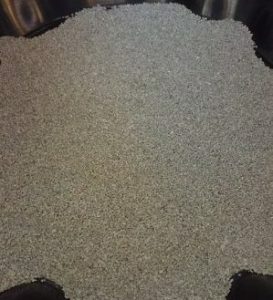 Also, the fact that this clumping litter gets hard in contact with liquids makes it stick to the bottom much more than other litters, creating more dirt on the bottom rubber of the Litter Robot. 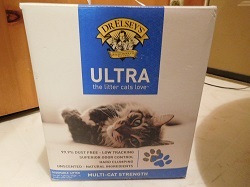 I also noticed the odor control after a week was not the same than other brands, although this cat litter has good odor control, according to my testing it was not excellent. The fact that litter residues stick to the rubber liner more than other cat litters, I put this brand in position #5. This cat litter has a good odor control but the scent could bother you if you don’t like fragrances. The clump formed really fast when I did my experiment but it broke down a little when sliding down the waste drawer, which is not good. The litter scattering wasn’t bad, so not a big mess around the Litter Robot. The dust when pouring down this litter into my plastic container wasn’t as low as I would have liked. I saw dust that I had to avoid. 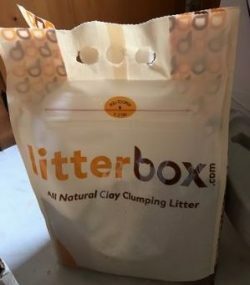 The good thing is that this litter comes in a box that is easy to open and easy to carry, due to a strong plastic handle, but not easy to pour down inside the Litter Robot. Still, the fact that the box is easy to open and carry it’s a bonus. Scoop Away litter weight is heavy which means the Robot requires less litter to provide the weight the sensor needs. This fact saves on cat litter much more. Due to its dust level and strong scent I put this litter in position #6. This is the result of my testing for the best litter for the Litter Robot. I will keep testing new brands and change the rating if I find a better one. I hope this article helped you! Disclaimer: All my conclusions are according to my experience using each one of the described cat litters with my Litter Robot III. I am not making official statements regarding each brand but only reviewing and concluding according to my personal experience. Very helpful! 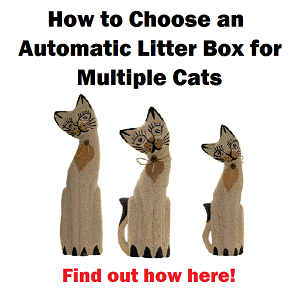 Would love to see your thoughts on Worlds Best clumping litter. Hi Amy! I am planning on keep testing more cat litters to add to my experiment. Thanks for your comment! Thank you SO much for making this article! 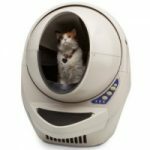 This was beyond helpful for me, as I just got my Litter Robot III for my 3 kitties. I’ve been trying Dr. Elsey’s, but really don’t like the smell. I’ll be trying some of the ones you recommend this week! Thank you! I am happy to know that my article helped you! Great review. Thank you so much for putting this together. We have 5 cats and use the unscented Fresh Step litter. The litter is great, but I have noticed that sometimes the lump gets really wet and then gets stuck on the wall of the litter robot and smears it. Have you noticed that as well in your tests? Do you have a solution for this? Hello Petra, what’s the delay time of your Litter Robot? I have mine with 7 minutes and yes, the clumps are not that firm but I haven’t experience the clumps breaking down or getting stuck on the wall. Let me know what’s the delay time you have set for your unit. Hello Joseph, the Litter Robot works with clumping cat litter. Any litter that has the ability to create firm clumps and that can be effectively sifted by the screen it works. Clay clumping litter happens to work optimally with the unit. What type of cat litter do you have in mind? it may be a good experiment to test a non-clay type cat litter.